NETWORK UPDATE: The only change from preliminary numbers was a 0.1 dip for AQUARIUS to an even-worse 0.2. In the live-action world, the preliminaries to the UFC pay-per-view Ronda Rousey match gave Fox Sports 1 the nightly win at 0.60. Starz’s POWER dropped 0.07 to 0.50. ESPN’s PREMIER BOXING was at 0.42. A pair of children’s shows cracked the Top 10: Nickelodeon’s PIG GOAT BANANA CRICKET at 0.40, and Cartoon Network’s POKEMON at 0.30. An original episode of COPS on Spike was at 0.34. Food Network’s PIONEER WOMAN returned at 0.33, while KITCHEN AT FN dropped 0.09 to 0.19. HELL ON WHEELS (AMC) gained 0.05 to 0.30. 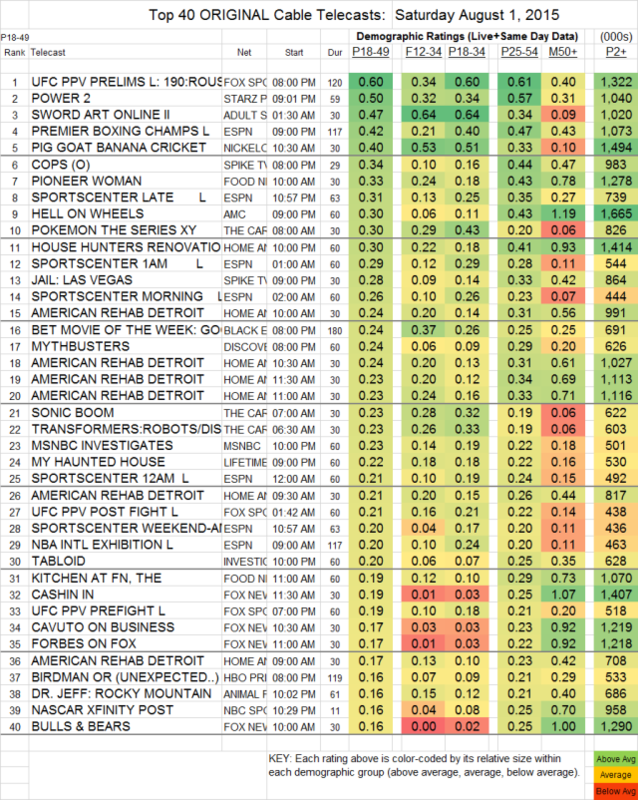 On Discovery, MYTHBUSTERS lost 0.06 to 0.24. Hallmark’s CEDAR COVE was at 0.15. BIG BROTHER AFTER DARK (POP) was at 0.04/114K.